Douglas Mill’s house is one of 15 houses at Hobsonville Airbase classified as a heritage building. These built heritage landmarks are being retained during the transformation of the former RNZAF base into a new housing estate. One of the reasons the house is being preserved is due the significance of Douglas Mill; one of New Zealand’s pioneer aviators. Mill was one of the first fliers to see the potential for commercial aviation in New Zealand. In 1927 he established the Air Survey and Transport Company at Hobsonville. One of its specialities was aerial surveying and photography, but the company was also the New Zealand agent for Britain’s De Havilland Aircraft Company. As De Havilland’s agent the company imported and assembled De Havilland Moths and Tiger Moths, which Mill then sold to aero clubs throughout New Zealand. 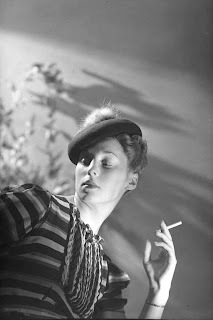 During the mid twentieth century, there was no NZ photographer more versatile, imaginative and accomplished than Reginald Clifton Firth (1904-1980). Yet he fell into photography by fluke. When he was young, he he trained as a graphic designer at the Elam School of Art in Auckland. In the late 1920s and early 1930s he made a living as a commercial artist. By chance, a client asked for photographs of company products rather than drawings. Firth bought a camera for £4 from an Auckland shop in anticipation of the job. However, knowing little about photography and feeling concerned that he wouldn't do a good job and lose hard earned cash, he asked the shopkeeper for a money-back guarantee. He needn't have worried since the client was delighted by the results. This changed Firth's career path forever. 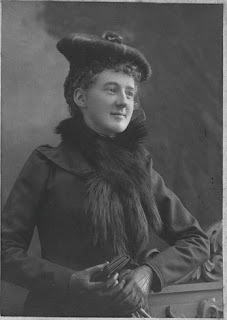 New Zealand writer Jane Mander (1877-1949) lived overseas for 20 years, spending time in New York and then in London. During this period she published six novels. She returned to New Zealand in October 1932, with the intention of writing further fiction novels. However, due to the poor health of her elderly, demanding father (who lived to be 95) she ended up having to balance being a care giver with journalism work. 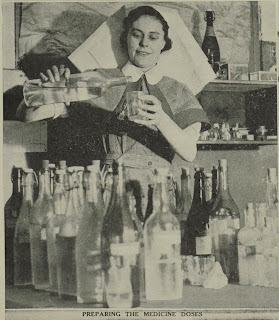 Since she had no other income, she took on a strenuous workload of magazine articles, book reviews and radio talks. Ever wondered what it would be like if animals lived like humans? Well here is your chance to find out ... 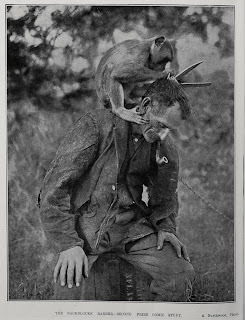 Gathered from the vaults of Auckland Libraries' heritage collections are a comical selection of images of animal doing human things. Enjoy! The Wellcome Library was founded on the collections from Henry Solomon Wellcome (1853-1936), a pharmaceutical salesman. Wellcome was interested in the history of medicine as well as related subjects such as such as alchemy, witchcraft, anthropology and ethnography. In the late 1890s he started forming his book and artefacts collections. He used agents from around the world to sources items and was almost obsessive in the pursuit of collection pieces. His intention was to create both a library and a museum accessible to the public, however he died in 1936 before this was realised. He left most of his estate and collections to a body of trustees, who formed the Wellcome Trust. 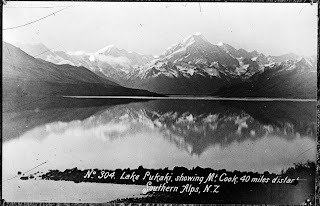 The National Parks Act was introduced in 1950 and the Department of Conservation Aoraki/Mount Cook National Park was established 60 years ago - this region is a significant area of skill testing for accomplished climbers, including Sir Edmund Hillary who made the historical first ascent of Everest the same year the park was formalized. The park's alpine environment includes 19 peaks, its namesake as well as Mount Tasman which are two of the highest mountains in New Zealand. I can’t believe the speed at which 2013 is hurtling along, and that 2014 - and with it the centenary of the outbreak of WW1 – will soon be here. Not an anniversary to celebrate, of course, but a time to reflect on the suffering humanity is capable of inflicting upon itself. 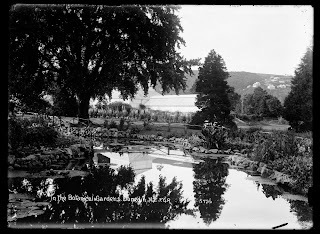 The first botanic garden in New Zealand was established in Dunedin 150 years ago, and there are events taking place in the city to mark the occasion. One such event is a photographic exhibition that will run August through to November, and will be held at the Dunedin Public Library. The Botanic gardens are more than important to Dunedin however. In 2010 they were ranked as a Garden of International Significance by the New Zealand Gardens Trust, a ranking aimed at attracting overseas visitors. They are the only public garden on the list, although neighbouring Larnach Castle also has an international ranking. 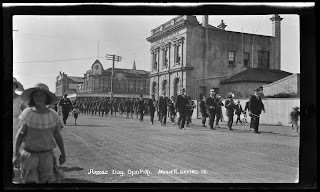 For a quarter of a century, the Mercury Theatre was the leading theatrical company in Auckland and one of the largest, most professionally run and most important performing arts organisations in the country (see an earlier post on 23 April 2013). A dozen or more shows were performed every year at this venue, ranging from children's pantomimes to cutting-edge drama. For many years it was assumed that this well known series of maps covering the Auckland area was just confined to the Auckland isthmus and the Birkenhead Point to Devonport area of the North Shore. However, Auckland Libraries has now received and made available additional sheets that dramatically extend the reach of this map series to the North, West, East and South. 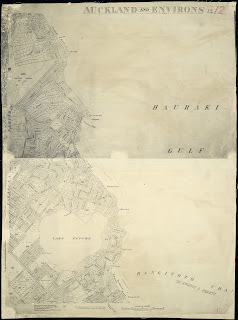 The maps are accessible through a link on thelibrary catalogueas well as Auckland LibrariesHeritage Images databaseby entering the terms 'auckland and environs' into the keyword search box. 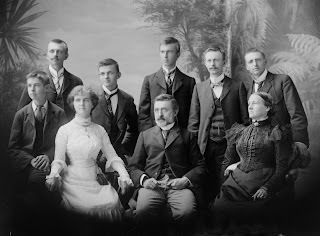 We have already seen the splendid selection of moustached gentlemen photographed by Aucklander Herman Schmidt (1872-1959) (see posts on 1 and 3 July 2013). Now for your viewing pleasure here is an illustrated tour of Hats from the Schmidt collection in the Sir George Grey Special Collections. Ranging from women in the bizarre, beautiful and downright embarrassing, Schmidt photographed men, women and children in them all! 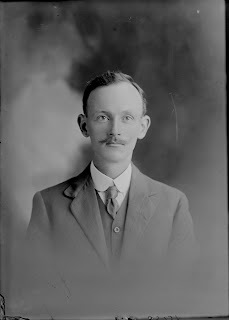 Herman Schmidt (1872-1959) was a prolific and talented Auckland photographer working at a studios on Queen Street throughout his training, professional career and eventual retirement in 1942 (see post on 1 July 2013). 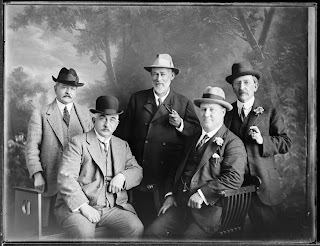 Here is an illustrated tour through images of moustached men from the Schmidt collection at the Sir George Grey Special Collections at Auckland Central Library. Enjoy! It sounds like something out of a movie but it is true .... 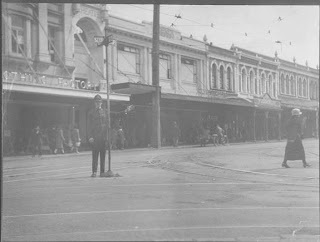 In 1970, a construction worker found a large number of glass-plate negatives stored in the attic of the Edson’s Building, a century-old structure at 270 Queen Street, Auckland which was marked for demolition . 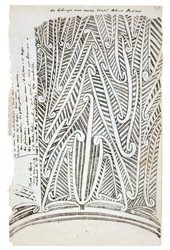 News of this discovery travelled fast and when deputy librarian Wynne Colgan and New Zealand reference librarian Pat French heard about it, they organised a speedy rescue mission. A team of determined rescuers climbed repeatedly up into the attic and carried out the precious find. Around 26,000 half plate and whole plate negatives were saved. These images represented the lifetime’s work of the gifted and versatile photographer Herman John Schmidt (1872-1959). Amazingly, Schmidt’s accession registers and day books were also found and saved - these have proved to be essential for identifying the subjects of his portraits.